Two artists, both inspired by the natural world, interpret their subject matter and choose locations in their own distinct styles. Alison Nicholls is an artist inspired by Africa. She lived in Botswana and Zimbabwe for several years and returns to Africa on a regular basis to sketch in the fields, work with conservation organizations, and lead Art Safaris for Africa Geographic. While anatomical correctness is important in her work, her color palette is chosen to set the mood or indicate a time of day. Washes of transparent color both obscure and reveal the animals in her paintings. Alison is a member of The Explorers Club; the Salmagundi Club; Artists For Conservation; and the Society of Animal Artists. Her work has been widely exhibited and she makes a donation to African conservation organizations from every purchase of her art. Sean Murtha paints wildlife (primarily birds) with special attention to their environment in a loose but naturalistic style. His work depends on sketching and painting in the field, and a familiarity with subject and place, and thus is most inspired by subjects close to home in the Northeast. Raised on Long Island and living now in Norwalk, CT, he has a special fondness for the Long Island Sound and the birds that can be found there. In addition, he is also known for painting dioramas for museums, most significantly at the American Museum of Natural History in New York City. 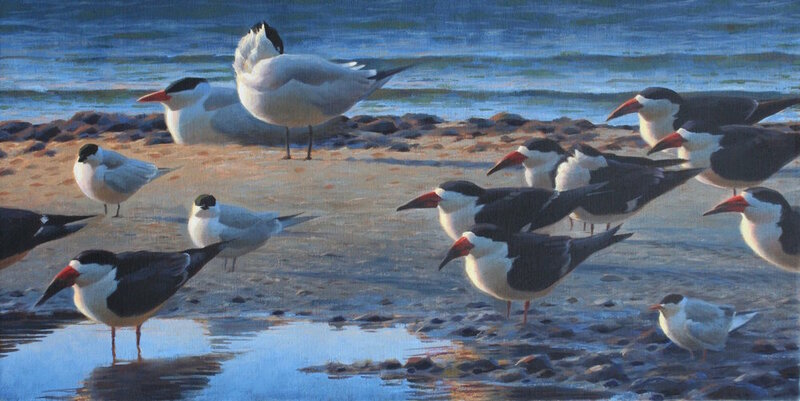 Sean is a member of the Society of Animal Artists and the Lyme Art Association, and has frequently exhibited at the prestigious Birds in Art exhibition in Wausau, WI. In conjunction with the Birds & Beasts: Near & Far exhibit, curators Alison Nicholls & Sean Murtha will lead a group through the sketching of live animals!